What is it? It's a Cafe Bike!! Cafe bikes are road bikes with flat bars and adjustable stems so you can ride with more comfort and control than a regular road bike and far greater speed than a hybrid or comfort bike. 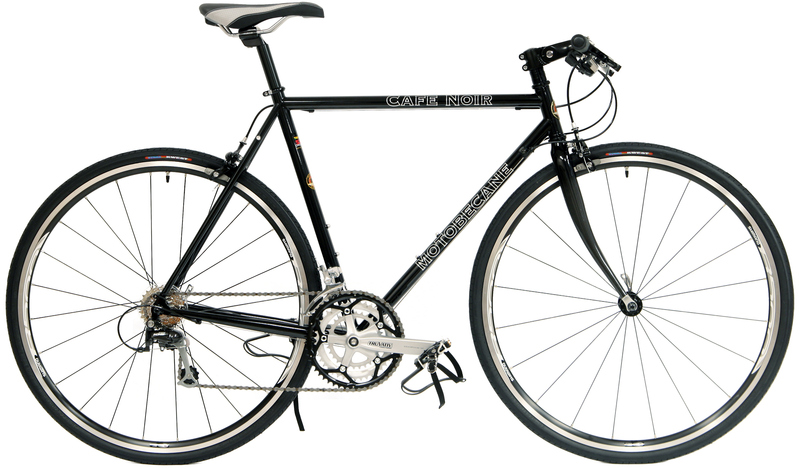 The Motobecane Cafe Noir comforts you with the superior ride of a meticulously handcrafted 4130 Chromoly frame and Pro Quality MWings Kinesis Comp Carbon Fiber Fork, (FREE Factory UPGRADE TO NEW SPEC Shimano WHR-500 Wheelset) and durable, competition quality Shimano 105 components. The Cafe Noir improves upon the Latte with even smoother riding, shifting and comfort! The smooth ride and stable handling is perfect for those relaxing weekend tours of the countryside. Frames made of Reynolds 520 CrMo, a branded variant of 4130 CrMo. These bikes are specially discounted as a fraction of frames did not receive the 520 decal. Amazing ride quality. Stem Kalloy Adjustable Rise, Black Polish Aluminum, threadless, 1"
This bike comes 90% assembled.